If you would like to resurrect the true taste of the mouth-watering shawarma you can drop by Mearmisha, a small shawarma boutique featuring a range of authentic and traditional roasted Shawarma is located at Mahboula, Kuwait. The restaurant caters to a variety of tastes through specially prepared sliced beef, chicken or vegetables each of which are marinated with a mélange of flavorful spice combinations, all tucked inside warm fresh-baked flatbread, topped with fresh ingredients, and ultimately dressed with a selection of five different sauces giving you an abundance of flavors. 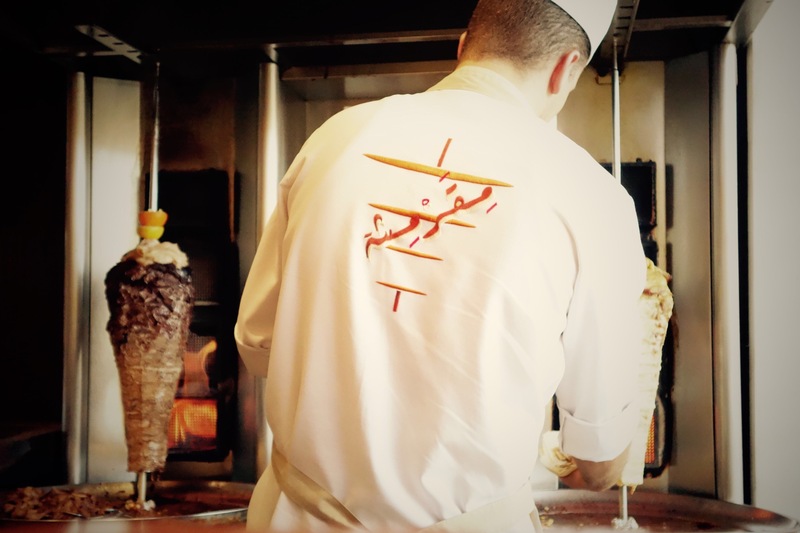 The shawarma master slices off shreds of spiced meat from the rotisserie after which the sizzling shavings of the tender meat with its crispy edges are encased in a warm bread and kept succulent with a variety of flavorful garlic and herb sauces. After being rolled and folded, the sandwich is then pressed onto a grill to give the bread an extra delightfully toasted crunch and eventually that’s a wrap! You can watch the entire preparation of this fulfilling ensemble from start to finish from an open kitchen view as you will be tantalized and anticipating your first bite. Together with your meal, salads of taboula and fatoush are available as well as vine leaves and cabbage rolls. Meamrisha also serves an array of sandwiches including falafel, grilled haloumi, labnah, turkey, and a range of other saj items. You may choose to have a standalone meal or opt for a family or diwaniya meal for a sharing feast, in which you can taste the broad variety of shawarmas comprised of beef and chicken carefully arranged onto a platter, alongside tasty accompaniments of onion rings, jalapeno cheddar poppers, and French fries. Additionally, a variety of chutneys are offered; a relish made up of fruits, spices, and herbs that you may want to dunk your choice of sides in. A nice selection of tasty, sinful desserts are available on the go, including red velvet cheese cake, chocolate mousse, oreo mousse, and more. If you are pondering about where to have a quick bite, Mearmisha makes for an indulgent take-out meal. Next PostVideo Games are an Exciting New Step for Storytelling!